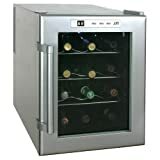 If you tend to keep only around a dozen of bottles of wine at home then a 12-bottle wine cooler refrigerator is a practical appliance fort short-term storage at proper temperature and humidity level. 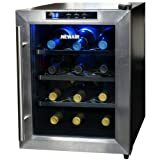 We’ve listed and reviewed the most popular 12-bottle wine cooler refrigerators on this page. These small-capacity wine coolers are often thermoelectric units. The application of thermoelectric technology in kitchen appliances is rather new but it has numerous benefits such as quiet operation, no vibration, low electricity consumption. The Sunpentown WC-12 Thermoelectric 12-bottle Wine Cooler has two removable shelves where you can place maximum 12 standard size wine bottles. You can adjust temperature between 50°F – 66°F. As a benefit of thermoelectric cooling the fridge is silent, its noise level is only 30 dBA according to the manufacturer. 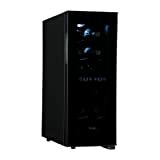 You can buy the Sunpentown WC-12 wine fridge for around US$117 – US$ 125 (US$9.75 – US$10.42 per bottle). Click for more Sunpentown Wine Coolers. This slim wine cooler by Avanti is perfect for budding wine-lovers with limited space in their homes. The Avanti EWC120B wine fridge holds 12 Bordeaux-sized wine bottles on its slide out, chrome-plated shelves. To store larger bottles (champagne) you have to remove one of the shelves to make room. You can easily adjust the temperature with the thermostat. The double pane doors ensure good thermal insulation so your wines will be kept at the set cooling temperature. Another convenience of this model is that the door is reversible so you can change the direction of opening. The interior light can be turned on or off according to your preference. The Avanti EWC120B wine cooler model is thermoelectric which cannot compete with traditional, compressor-run fridges in cooling efficiency but it has its trade-offs: silent operation and no vibration (vibration should be avoided when storing wines because it unsettles sediments in the wine). Find out more about thermoelectric wine cooler refrigerators. In other words, thermoelectric wine fridges aren’t able to generate constant cool air within the unit as efficently as a traditional electric wine cooler or a fridge. For best cooling performance place the cooler in a room where the temperature is around 72°F – 78°F. TIP: This wine cooler is single temperature zone so if you’re going to store both reds and whites in it place the reds on the bottom and the white wine bottles on the top. The fridge cools from the top to the bottom so it’s a bit cooler in the upper part. But if you want to just keep your wines from going off at room temperature and want them chilled to pleasant drinking temperatures then the Avanti 12-bottle wine cooler is a good buy for its price. The model comes with 1 year limited warranty. Price range: US$ 100 – 158 (US$ 8.33 – 13.16 per bottle). Find reviews of other Avanti Wine Cooler Refrigerators. The Avanti EWC1201 is a new version of the EWC120B. It is a slim (10″ wide) countertop unit that accommodates up to 12 bottles of wine. 8 bottles can be placed horizontally on the chrome-plated wire shelves and 4 bottles can be stored in upright position. It is a moderately priced unit: US$ 95 – 130. Read a detailed review on the Avanti EWC1201 12-bottle wine cooler. Koolatron 12 bottle wine coolers are slim units that can be fitted in narrow places. Its width is slightly more than 11 inches. The major features include adjustable temperature control (temperature range: 48°F – 64°F), double-pane, tempered glass door and quiet, vibration-free operation due to the thermoelectric cooling technology. Read reviews of other Koolatron Wine Cooler models. Price range: US$ 125 – US$ 180 (US$ 10.41 – US$ 15 per bottle). The EuroCave Le Petite Wine Refrigerator is also a slim, 12″-wide cabinet that stores 10 bottles horizontally and you can also keep and preserve the quality of 2 opened bottles of wine in it. Find more reviews and ratings of slim wine coolers. The NewAir AW-120E is a cheap thermal electric cooler for countertop placemnet. The black cabinet has a double pane tinted glass door with black frame. The one touch button controls and the blue LED display are built in the top door frame. 3 pull-out chrome-plated wire shelves hold the wine bottles (standard size and shape: 750 ml, Bordeaux style). A soft LED interior light illuminates the interior (switch is on the control panel). Price: cc. US$120 (US$ 10/bottle). There’s a silver color model (NewAir AW121E that sells for around US$ 130). See more wine chillers by NewAir. This model by Vinotemp has an elegant black body with stainless steel door trim and bar handle. The thermoelectric cooling system ensures silent and vibration-free operation. Although thermoelectric coolers have their advantages their main drawback is that for efficient cooling they can be used in rooms where temperature doesn’t exceed 77°F. The units can only be used only as freestanding, placed on top of a counter or table. The digital display and push button control panel is built in the upper door frame. The 12 bottles can be arranged on 3 slide-out chrome-plated shelves. The Vinotemp 12TEDS comes with double paned, tinted glass door for adequate thermal insulation and UV protection. Price: cc. US$ 189 (US$ 15.75 $ per bottle). Warranty: only 90 days. Unfortunately the model has got very low ratings and owners complain a lot on the product’s low quality and bad customer service of the company. 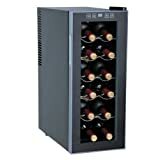 It is a thermoelectric two temperature zone wine fridge with separate temperature controls and display for each zone. Dual zone units are rare in the category of small capacity wine coolers so if you look for one to store your red and white wines at their recommended serving temperatures then the Vinotemp 12 TEDS-2Z might be a good choice. Check out other Vinotemp wine cooler refrigerator models. Take a look at Wine Enthusiast Silent 12-bottle Wine Refrigerator. Read reviews of Haier 12 Bottle Wine Coolers. The Chambrer 9+3 wine fridge allows the owner to place 3 bottles in upright position. TIP: Vinotemp has recently launched a new 12 Bottle model: the Vinotemp VT-12TEDi wine cooler that features a new sleek design and hopefully is of better quality. Best Mini Wine Coolers – compare 4-Bottle Haier, Chambrer and Koolatron Models. 6-Bottle Wine Coolers Comparison – compare popular 6-bottle countertop wine fridges. 8-bottle Wine Cooler Comparison – compare various 8-bottle electric home cellars. Cheap Wine Coolers – read reviews of some quality inexpensive wine refrigerators.